Square-goers may no longer be able to smoke electronic cigarettes inside if the Oxford Board of Aldermen votes to pass the ordinance change they proposed during their meeting on Tuesday, April 2. The Board of Aldermen gave the first reading of the proposed ordinance to amend Chapter 50, Article IV-Smoking Ban of the city’s Code of Ordinances. 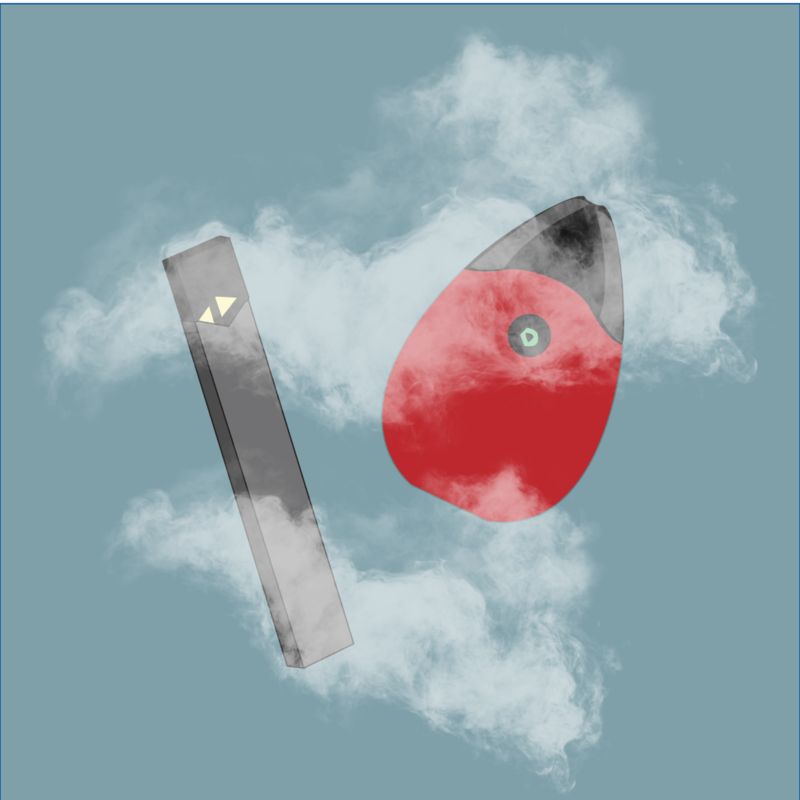 This reading proposes changing the smoking ban to add any “electronic smoking device” to the ordinance, meaning that bars, restaurants and establishments on city-owned property will no longer allow patrons to use devices such as Juuls. Graphic Illustration by Elise Brandwen and Mackenzie Linneen. The ordinance was proposed at the suggestion of local business owners, according to the aldermen. Police Chief Jeff McCutchen said that electronic smoking devices are a problem that was not explicitly addressed in the smoking ordinance, and the verbiage needed to be changed. Lee Harris, owner of Funky’s Pizza and Daiquiri Bar, said e-cigarettes do not really bother him because they don’t smell like cigarettes, and he has not had any problems or complaints regarding e-cigarettes in his establishment. Former Library Sports Bar bartender Alexandra Santiago said she can see the proposed ordinance change creating a problem for bar staff, but she also sees why it would be a positive change for restaurants and businesses that are more family-friendly. University of Mississippi students have responded to this proposed ordinance change with mixed emotions. “As a non-smoker, I think that people think e-cigarettes don’t have as many adverse effects as cigarettes,” said political science major and incoming Associated Student Body Judicial Council chair Liza Boyer. People aged 18 to 24 are using e-cigarettes at increasing rates, according to the Truth Initiative, but many are still against their public use. “As a non-smoker, it’s really annoying having smoke always blown in my face, even if it doesn’t smell like cigarette smoke or smells good,” elementary education major Carlye Mann said. The University of Mississippi is technically already a smoke-free campus, but university officials have had problems with student use of e-cigarettes. McCutchen offered a piece of advice to those who plan on using e-cigarettes. “Educate yourselves on what this is costing you. It is not just vapor and flavor — it has lasting effects,” he said. The second reading of this proposed ordinance change will happen at the next Board of Aldermen meeting at 5 p.m. Tuesday, April 16 in the City Hall courtroom. All Board of Aldermen meetings are open to the public.